Zinc not only physically blocks sun rays, it is also soothing to the skin. Try to get one that is SPF 30 or higher and make it a part of your daily routine, even if you plan to stay indoors. Remember, sun rays coming through a window can also damage the skin. 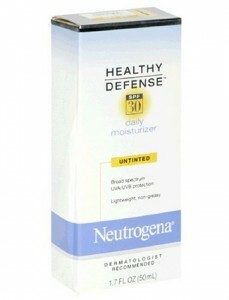 Neutrogena Healthy Defense Daily Moisturizer ($12.99. Neutrogena.com) contains both zinc oxide and titanium dioxode (another good physical ray blocker), while Eucerin Sensitive Skin Everyday Protection Face Lotion ($7.19, Drugstore.com) is gentle and effective.